If you own a boat or any other marine vessel, then you obviously know that adding a stereo system would enhance your entire sea experience. Speakers play a major role in enjoyment at the sea. They allow you to listen to cool music or radio stations while doing what you love in the sea. On the same note, if you own a car, you surely love listening to music while driving or camping. When time comes to replace older speakers or install speakers in your boat or car, you might be wondering whether you can use marine speakers in your vehicle or use car speakers in your water vessel. Well, both types of speakers have their own differences. Read on through this article for the unknown differences between marine speakers vs car speakers. Marine speakers and car speakers differ a lot with respect to longevity. Marine speakers are usually made for use in a humid and salty environment while car speakers are used in a normal environment without harsh conditions. Thus, marine speakers are basically designed to survive harsh sea conditions. Also, marine type of speakers are made to survive prolonged exposure to hot sunlight and rapid changes in temperature. For instance, marine speakers have special plastic that can sit under the hot sun throughout the day and get splashed with salty, cold sea water without getting damaged. Basically, prolonged exposure to ultra violet rays makes plastic and rubber components softer. Also, it weakens the adhesives used on holding rubber and plastic components of a speaker together. On the contrary, car speakers are not designed in any special way. Their plastic and rubber components cannot withstand sudden temperature changes. Also, marine speakers are typically made with stainless steel components to protect them from corrosion and rust. On the contrary, car speakers are generally made using basic components that can easily rust when used in a salty, humid environment. Thus, if you were to use car speakers in a boat, they would hardly last long. Exposing car speakers to salty, humid and hot environment would damage them quickly, and this would demand replacement sooner. Most marine speakers are typically build using heavy duty components that can hold well in harsh marine conditions. Marine speakers usually have special plastic cones whose main functions is protecting the speaker from water damage. On the contrary, standard car speakers are made with simple paper cones. Such paper cones can easily get damaged when exposed to moisture. Also, marine speakers are surrounded by rubber to protect sensitive internal components from harsh elements. Grilles in marine speakers are also tougher than those of standard car speakers to keep the speakers protected. Manufacturers of high quality marine speakers usually put the speakers under rigorous testing prior to selling them. When testing them, they are put under worse conditions than they would be on a boat. Circuitry boards in marine speakers are usually coated with appropriate sealant without impacting on their performance. The sealants used are usually weatherproof for enhanced protection from harsh elements. On the contrary, standard car speakers do not have such special sealing since they are meant for use in an enclosed car space where harsh weather elements are not a major issue. 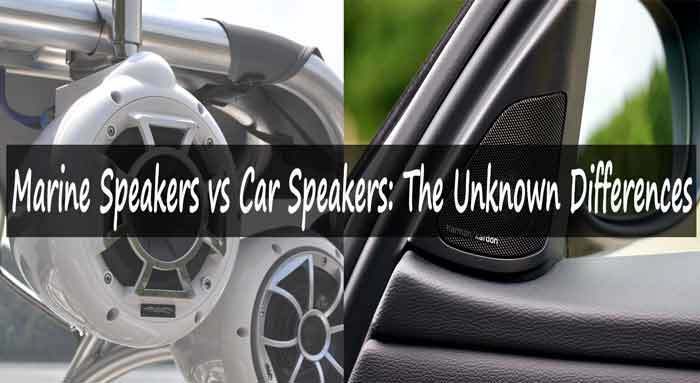 When comparing marine speakers vs car speakers, another major unknown difference between the two is that marine based speakers are usually made to overcome obstacles unlike car speakers. These speakers are typically used in an open water environment. As such, the sound emitted by marine speakers tends to compete with the obvious noise of water waves, strong winds and a roaring boat engine. On the contrary, car speakers compete with less obstacles. Moreover, car speakers function in an enclosed car environment such that they don’t have to overcome major obstacles like with marine speakers. If you opt to use car speakers in a boat, you will hardly hear the sound coming off the speakers due to competing noises from strong winds, waves and roaring of the boat engine. Using car speakers under such obstacles will lead to loss of frequencies. The technology used in designing marine speakers makes them sound powerful despite all the manner of obstacles they ever come across while in use in the sea environment. The ability of dispersing and projecting sound differs between marine speakers vs car speakers. The sonic functionality of a speaker is not just about within the water vessel but also behind it, especially when you are using it for waterskiing activities or even wakeboarding. Thus, for such functionalities, you will need to mount a speaker on a tower to project and disperse sound further behind your boat. Moreover, water sports are hardly done on a straight line. You will often move side to side without control. Your path will be wider and hardly straight. As such, you will need to use a speaker that can disperse sound in a wider area. A marine speaker is designed to project and disperse sound to a wider area than a car speaker. A standard car speaker may lack the ability to project sound to a wider path as it is designed to project sound in a small, enclosed car space. Marine speakers typically cost more than car speakers. These speakers are designed to hold well under extreme conditions while still offering great sound and performance. Standard car speakers are not designed with any special requirements in mind. Thus, it's more expensive to build marine speakers than car speakers. This makes car speakers more affordable than marine speakers. As such, you won’t be surprised to find someone using car speakers in their boat due to their affordability. Although marine speakers and car speakers are more like the same thing, they have major differences especially with regard to the conditions they can withstand. When comparing marine speakers vs car speakers, marine speakers differ with regular car speakers in terms of durability, cost, sound projection, overcoming obstacles among other differences. Although they may have the same kind of internal circuitry, some of their components vary significantly. As such, it’s best using marine-only speakers in your boat and leaving car speakers for use in cars.